Congress ends furloughs at Federal Aviation Administration: The last-minute fix for the FAA will make sequestration worse. Congress’ fast fix for ending the FAA furlough will make sequestration worse. 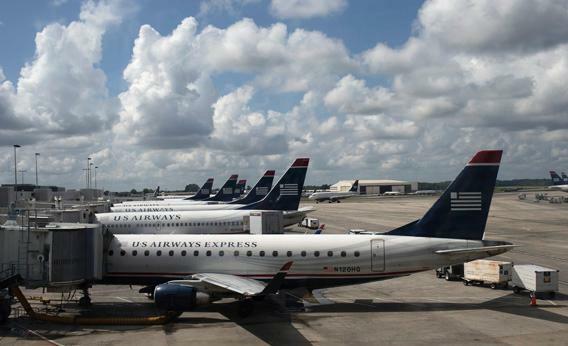 U.S. Airways planes lined up at a passenger terminal at the Charlotte Douglas International Airport in Charlotte, N.C., July 15, 2012. Before I go on vacation, I work a little harder. It makes me feel like I deserve the break. Charlie Chaplin said if he didn’t write every day, he felt he didn’t deserve dinner. Members of Congress apparently feel the same way. Before they went on recess this past week, they were hard at work on their most sustained long-term project: tanking their approval ratings. By now you’ve heard about the last-minute legislation that bailed out air travelers on Friday. Hell hath no fury like a crowded departure lounge, so Congress lunged to give the Federal Aviation Administration flexibility so that it wouldn’t have to ”furlough air traffic controllers in order to comply with sequestration. Conventional wisdom seems to be that this deal was politically terrible for Democrats. Anything that smooths the rough edges of sequestration makes it less likely people will seek out a more balanced budget to replace it, of the kind the president is offering. Republicans say the legislation—which didn’t give the FAA more money but gave it more flexibility to work with what it has—proves you can shrink the government and be smart about it. (Ezra Klein argues the legislation was dumb for Republicans, too). It’s worth pausing for a moment to evaluate how the sequester virus has mutated during its short life. What started as a tool to focus Congress on long-term solutions to that part of the budget that needs the most attention, is now pushing Congress even further into obsessing about short-term fixes in that portion of the budget that doesn’t need the attention. To recap how we got here: Members of Congress are elected to solve the big problems of the day. The cockeyed budget is a big one. America isn’t growing very fast (since the recession ended in mid-2009, quarterly growth has averaged a measly 2 percent), and the spoils are uneven. (In the first two years of the recovery, the mean net worth of the upper 7 percent of wealthiest households went up 28 percent. The lower 93 percent went down 4 percent.) The tax code is too complicated, and entitlements need to be redesigned to accommodate an aging population. These are tricky problems that, as Mitt Romney would say, need to be discussed in quiet rooms. Congress was incapable of having these conversations, so it designed sequestration: across-the-board cuts in the portion of the budget where people would feel it the most. The theory was that this pain and grief would force lawmakers to have that conversation about long-term problems and solutions. It didn’t work. Congress still couldn’t be convinced to think long-term. This FAA fix compounds the problem. It represents yet another round of short-term thinking. Congress is moving in the wrong direction, and it’s also making it harder to reverse course. Answering the bigger budget questions requires engaging in a public debate. That means to get anything done lawmakers must have some measure of credibility. Whether the topic is taxes, investment, or entitlements, there is one essential argument provided by elected officials who are trying to persuade their colleagues and voters to favor change or reform: Do this thing you might not like because the alternative will be worse. But no one is going to accept your argument if they think you’re crying wolf. So the first reactions from voters and pundits to the sequestration-nightmare scenarios were that some politicians were being overly dramatic. It’s not going to be that bad, and if it does get bad, politicians will scramble to fix it. Congress proved the skeptics right by fixing the FAA when people squawked. Instead of making people think that lawmakers were right when they predicted calamity, this work-around is likely to have the opposite result. No one is going to pay attention to the peculiarities of the FAA budget—why it was relatively easy to fix and why the fix in this case is hard to apply elsewhere. Instead, they are likely to go on believing that all non-FAA sequester-related scenarios have been overblown (otherwise Congress would take action like they did last week!). People won’t worry that sequestration is causing great harm because look at how quickly Congress can act when the situation demands it. Meanwhile, the long-term problems still aren’t being addressed and the people without lobbyists who depend on government won’t get heard. So Medicare patients are not receiving chemotherapy and fewer elderly recipients of Meals on Wheels are getting food. The danger is that congressional warnings are going to become like renewal notices from your favorite magazine. You seem to get one every month, even though your expiration is months from now. You’ll keep throwing them away unopened until they send you the pink one saying your subscription is going to be canceled. That’s when you take action. That might be fine when it comes to your subscription to Garden & Gun, but it’s not so smart when it comes to your mortgage payment. By the time they’re holding the auction for your house in your front yard, it’s too late.